Seafaring fishermen are quite superstitious and do not like whistling when at sea. They believe it is 'whistling for the wind' which will blow up fiercely. Hopefully, in writing about past floods it will not be tempting providence. Eton Wick is reputedly on a flood plain* and I occasionally get asked about past events that I presume is the result of insurance premiums. It would be a comfort to believe the Jubilee River is a definite guarantee of no future flooding locally, but of course, when it comes to weather, nothing can be a certainty. As a schoolboy in the early 1930s, I well recall the Eton Wick Road being flooded across the `slads' on at least two or three occasions. This is the first area to be flooded near Eton Wick. The 'Slads' is that grass stretch both north and south of the main road a few yards east of the rail viaduct. On the walk to 'Porny' school we excitedly saw water on the 'slads' south of the road and sure enough on the way home later, the water had risen enough to be across the road and covering both sides of the old grazing land, enough to necessitate the long plank footbridge being erected between the viaduct and the Folly Bridge cattle pound, from where the ground rose suddenly above most flood levels. (See photograph on page 4). The footbridge was quickly constructed by pushing steel handrails through the top of about 30 steel posts permanently in situ across the 'slads' and then fitting planks about 1 — 1½ feet above the ground and secured to brackets fitted to the posts. When not in use, the handrails; brackets and planks were safely stored under one of the viaduct arches. They were not used much after the 1947 flood. Gradually the posts rusted and fell into the grass but the other materials and planks seemed to vanish; perhaps as rumour suggested, were misappropriated. The last of the posts, I understand, went to Windsor as a future item of interest for the local museum. One of the most flooded parts of Eton Wick was along Common Road, although rarely getting into homes. really exceptional, the first in 1894 and the next in 1947. In many ways, these were very different in timing and cause. The deeper flood came in November 1894 after heavy rains beyond the river's ability to cope. Coming in early winter made it very difficult for inundated homes to dry their possessions effectively. It was perhaps four months before doors and windows could be opened to the elements. The 1947 flood was quite different. It came in March after six weeks of almost constant snow and rain falls accompanied by hard frosts. The result was a thickness of packed and frozen fall on deeply frozen ground. The improved March weather thawed the surface and, being unable to soak through the frozen ground, found its level on the surface. Perhaps a repeat of the 1947 weather would be beyond even the Jubilee River to cope with. Of course, the 1947 flood did allow for the summer to effectively dry out. 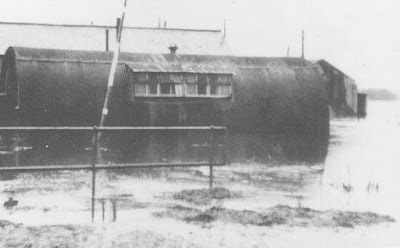 This latter flood came about 19 months after the end of WW2 at a time when Eton Wick had no electricity; there was a severe shortage of fuel; food and clothing was still rationed and most of the young (and not so young) were desperately trying to set up home after nearly six years of war service. Against this background, I will mention a few particular incidents, but doubtless, those of you who experienced the 1947 flood will have your own favourite memories. My family home was an early 18th Century detached house that stood near the Common Road Jubilee oak tree. In 1894 this house was occupied by a Miss or Mrs Tarrant. In mid-November, the ground floor was flooded and the good lady was obliged to move upstairs. Like many others, she had several chickens and these also went upstairs. The 1947 flood did not get beyond the doorstep but I did see Mother pushing a knitting needle between the living room quarry tiled floor to anxiously measure how much more the water had risen. A few homes away lived the village blacksmith, Jack Newell, along with his daughter and her husband, Jennie and Allen Dowson. This was the end house of Hope Cottages which is one side of the lane to Common Road, with Wheatbutts Cottage on the other. Jennie was watching the village policeman coming down the flooded lane to make sure all was well. He suddenly disappeared from sight, so she went through the house to follow his progress. No policeman, but his helmet was being swept away in the flood. The water had concealed a deep hole it had 'washed' in the road and the PC had tumbled into the depths, along with his cycle. Wartime shortages were still resulting in food rationing, shortage of almost all goods and building materials, and very inadequate heating. My sister had recently been allocated a house in Eton but was still obliged to get the family food allowance from 'Chantlers' of Eton Wick. To get the supplies to Eton my brother paddled his kayak boat from Sheepcote Road along the flooded Eton Wick Road to the 'slads', then turning right across the Eton Recreation Ground, across Church Meadow and up Brocas Street, where he secured the boat and waded through Eton to Tangier Lane. There was continuous water all the way between Eton Wick church and Windsor Bridge. Many homes, the church and some shops were flooded. The photos we see often did not show the worse or the deepest floods, simply because everybody had too much practical purpose at hand and nobody knew where it was at its worse anyway. When floods are not 'rising' they have turned and are falling. Most roads were flooded and eventually the Eton Wick Road became too deep and hazardous. Workers and shoppers were conveyed to Slough, through Dorney by lorries belonging to R Bond (Contractors). A substantial anti-aircraft gun site had recently vacated Donley Common and home seeking ex-service persons had taken over the empty Nissen huts as squatters. Overnight the huts were flooded and women and infants were pushed to safety in a galvanised bath tub, a few by boat. South View residents had food passed up to the bedroom windows by boat. The army used DUKW vehicles to supply small bags of fuel and emergency foods. Floods as severe as those have many side effects. When water rises it forces rats to come above ground and there are many more rats than we are normally aware of. Other wildlife is obliged to converge on the remaining dry areas. When floods subside they leave the land and gardens strewn with flotsam —straw, rubbish, wood etc., and after the land is contaminated causing risk of tetanus. A village youngster died after just such an infection in 1947. Hopefully this is the past and we will not see the like again, but doubtless if it comes to it, everybody will do what is necessary — sink or swim. Above — in March 1947 - using the slads plank bridge. The Willow Tree public house is the higher building. Pub signpost also shown. Willow Tree cottages in the fore. 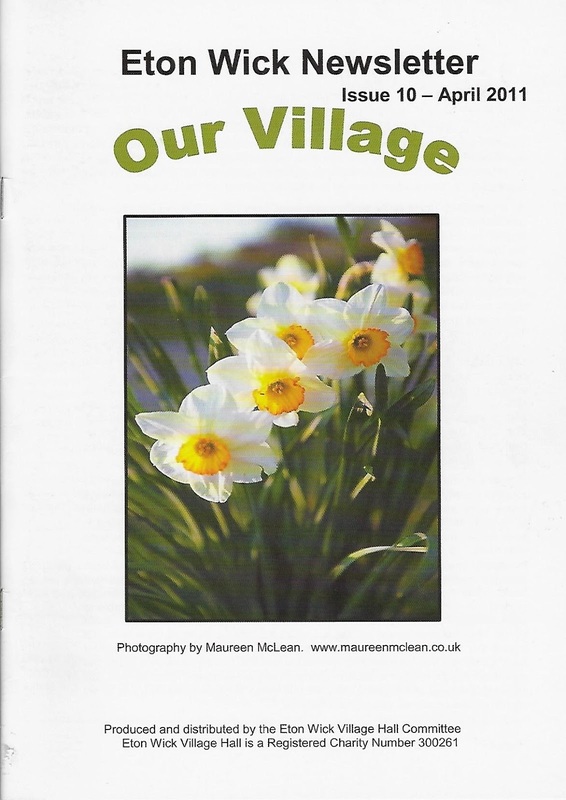 Click here to read Our Village April 2011. 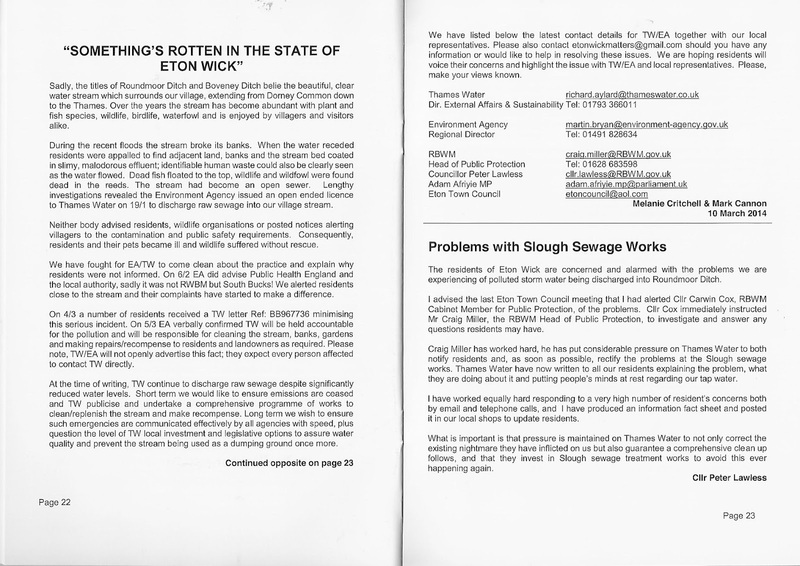 The effects of flooding of 2014 were reported on in 15th Issue of Our Village on page 22. *Note The Environment Agency flood map can be found through the UK Government website.